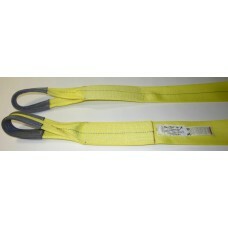 We carry polyester Tow & Recovery straps that may stretch approximately 3% of the length, in WLL from 10,000 lbs. to 110,00 lbs. with eyes on both ends. These straps are not Jerk Straps! You do not take a running start. 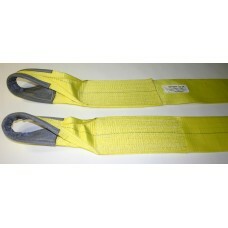 These are actual tow and recovery straps you can use on the highways as well. To use connect on equipment, take up slack and begin your pull. Custom sizes, lengths and ratings available. 2" X 20' Tow Strap With Eyes - Rated WLL 10,000 Lbs ..
3" X 24' Tow Strap With Eyes - Rated WLL 18,000 Lbs ..
3" X 30' Tow Strap With Eyes - Rated WLL 24,000 Lbs ..
4" X 30' Recovery Strap With Eyes - Rated WLL 32,000 Lbs ..
6" X 30' Recovery Strap 4 Ply With Eyes - Rated WLL 110,000 Lbs ..
6" X 30' Recovery Strap With Eyes - Rated WLL 82,000 Lbs ..
6" X 30' Recovery Strap With Eyes - Rated WLL 48,000 Lbs ..
8" X 30' Recovery Strap 2 Ply With Eyes - Rated WLL 100,000 Lbs ..